Published by:Clever Apps Pte. Ltd. Enjoy Candy Riddles - the sweetest match 3 puzzle! 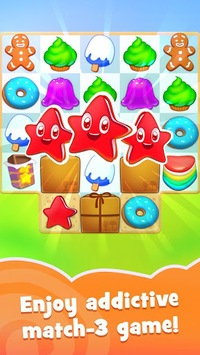 Cute cookies and colorful candies with fun animations will certainly get you hooked! 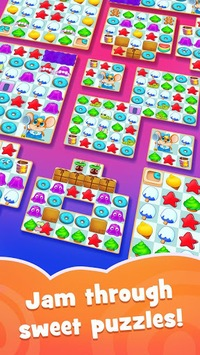 Jam through challenging levels matching scrumptious combos and collect great prizes! 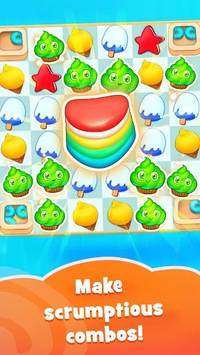 Connect delicious ice creams, pop cupcakes, match three pleasant characters in our addictive match3 game! We picked the best from match3 games to create the sweetest game ever: swap items to get 3 in a row and receive extra sweeties. If you like brain games - Candy Riddles is definitely for you. Our game is a real charm king among them! Meet with the Candyland inhabitants and travel together. Soda, Chocolate, Ice Cream, Jelly and more cute friends are waiting for you. Match and swap your own sweet road through the Ice Cream Forest and Candy Valley! ✜ Colorful graphics and joyful game process with various levels and challenging goals. ✜ Play in Candy Riddles alone or challenge your friends to get the highest score in the record table to collect extra bonuses and game boosters. ✜ Continue to play on any platform with automatically saved game progress. You can play on desktop and continue to play on mobile later with same game achievements. ✜ Candy Riddles is absolutely free to play an online game with optional in-game purchases. Hey! New levels in the game already! Hurry up! Play with us today!